If you have updated your computer to Mojave, you may have noticed that this new system does not always play HD MKV video correctly. Previously, people could count on installing some plugins or video codec packages to play MKV videos on Mac. However, after major updates are made to Mac system, the subsidiary plugins and video codes package tools do not apply to the new OS any longer, playing MKV video now becomes even more troublesome. Meanwhile, if you want to view MKV videos on Apple products (iPhone, iPad) or hope to edit MKV files with iMovie for uploading them to your blog or YouTube, the task is really arduous. To eliminate the difficulty in playing MKV on Mac, it is a smart idea to convert MKV to H.264 encoded video. H.264 (also known as AVC or MPEP-4 Part 10) is an industry standard for video compression. So far it is one of the most commonly used formats for recording and compression of videos. H.264 delivers better image quality compared with most other codecs. Video files with the extension MP4, MOV, M4V and so on usually apply H.264 as video codec. MacX Video Converter Free - it's an ideal MKV video processing freeware to help you free transcode MKV to H.264 with top quality. This free media file converter is lifetime free and 100% safe to convert MKV to H264, as well as decode MKV to H265/HEVC, MP4, MOV, AVI, FLV, WMV, AVCHD, VOB, etc. 180+ video and 14+ audio formats. 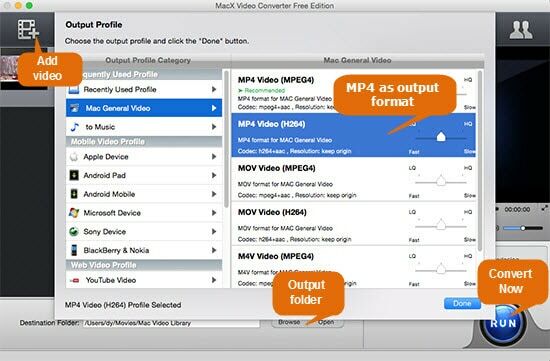 Thus, you can not only play MKV on Mac, QuickTime player, but also import MKV to iMovie, iPhone iPad, etc. more Apple devices. After you've done the MKV media to H264 conversion, you can further compress MKV files if the output H264 file surpasses your device storage capacibility. Its flexible parameter adjustment and video editing feature are good tools for you to reduce and compress MKV file size, like lower video resolution, frame rate, bit rate, cut off unnecessary parts from video, remove video black borders, etc. Free download this MKV video processing freeware and launch it on Mac, then click "Add File" to load the MKV files. Select the output video format you desire. For example, if you want to convert MKV to MP4 file encoded by H.264 codec, you may choose "MP4 Video (H.264)". All the profiles are preset for you to easily make a selection. If you would like to customize the output video to best suit your portable devices, you may adjust the output video parameters, including resolution, frame rate, bit rate, sample rate, etc with ease. Step 3: Transcode MKV to H264 Now. After completing the above steps, click the "RUN" button to start converting MKV to H264 on Mac. It will automatically help you process MKV video codec to H.264, and you could view the conversion progress and are able to cancel the process at anytime. Warm prompt: for those who pursue the output high quality, you're suggested to tick "High Quality Engine" at the lower right side of the user interface. Plus, move the slide bar from LQ to HQ on the output profile window to improve output quality. Last but not least, click "Settings" icon to adjust video parameters like turn up video resolution, video bit rate, etc. Thus, your output video quality can be guaranteed with 98% quality reserved. Convert MKV to H.264, MP4, MOV, AVI, MPEG, WMV, etc. Compress MKV videos to smaller size without losing quality. 2 [Fixed] Why won't VLC Play MKV and How to Fix? 4 [Solved] How can I Extract Subtitles from MKV Video?